At some point, the company was profitable, the VC suggested to sell the company and the founder said no, “I am not an engineer, I am just an entrepreneur, it will be very difficult for me to recreate such a company if it is sold” so the idea was to create new start-ups in Parrot (slide 21), the idea was to follow the boom of the cellular phones. In the same way Logitech developed while doing prepherical devices for the PC, Parrot wanted to do products around the cell phones. Parrot was a pioneer and one of the best innovators in the sound systems (slide 23): Good idea, good market, good technology but bad business (slide 25). Why bad business: too expensive and technological product. Do not loose time with un-important questions. There is only 2 things to do as an entrepreneur: 1) make a product 2) sell it. All the rest (financing, HR, marketing) is easy. The doors of the customers are always closed. Once you have money from VCs, be cautious with money (slide 55), Don’t spend your money (slide 56), Don’t listen the VCs that you have to go faster, to spend money. What you do? You Invest it (slide 57). You have to know exactly what to do exactly with the money. 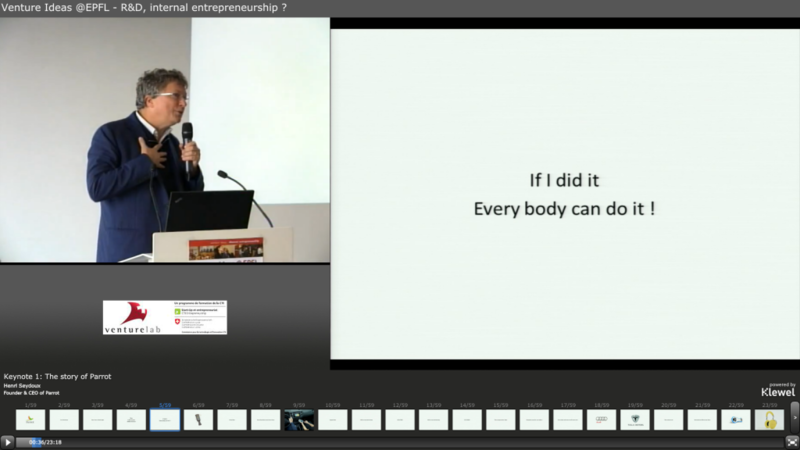 More business / start-up conference webcast can be found here: and http://startup.klewel.com/ (mainly in French). Great introduction by Hervé Lebret. More info on Swiss start-up eco-system: VentureLab, contact Jordi and his team.